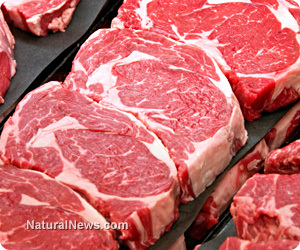 (NaturalNews) A scientific finding that red meat consumption increases the risk of cardiovascular disease and a heart attack early in life would not normally qualify as breaking news. Researchers have theorized for more than two decades that eating red meat leads to heart disease due to the high concentration of saturated fat, cholesterol and high temperature cooking methods. The fact remains that consuming red meats (and processed meats) does significantly increase vascular-related disease incidence, but not because of fat or cholesterol content. A research team from the Cleveland Clinic, publishing their findings in the journal, Nature Medicine have found that a compound in red meat and added as a supplement to popular energy drinks has been found to promote atherosclerosis, a disease process commonly referred to as hardening or clogging of the arteries. Scientists found that bacteria living in the human digestive tract metabolize the compound carnitine, found in abundance in red meats. Carnitine is broken down to produce a compound called trimethylamine-N-oxide (TMAO), a metabolite previously shown to promote atherosclerosis in humans. To conduct their study, researchers tested TMAO levels in 2,595 omnivore, vegan and vegetarian patients undergoing cardiac diagnostic procedures. They determined that a carnitine-enhanced diet from excess red meat consumption results in suppressed levels of gut microbes, as TMAO alters cholesterol metabolism at multiple levels, explaining how it enhances atherosclerosis. The team found that increased carnitine levels in the study patients was a strong indicator of increased risk for cardiovascular disease and major cardiac events like heart attack, stroke and death, but only in subjects with high TMAO levels. Researchers determined that high TMAO levels were found in those participants eating a diet predominantly consisting of red meat. Vegans and vegetarians experienced low TMAO levels, even when they ingested higher levels of carnitine, such as from supplementation. Lead study author, Dr. Stanley Hazen concluded "The bacteria living in our digestive tracts are dictated by our long-term dietary patterns... a diet high in carnitine actually shifts our gut microbe composition to those that like carnitine, making meat eaters even more susceptible to forming TMAO and its artery-clogging effects. Meanwhile, vegans and vegetarians have a significantly reduced capacity to synthesize TMAO from carnitine, which may explain the cardiovascular health benefits of these diets." The combination of high carnitine intake from red meat and increased TMAO resulted in the highest risk for cardiovascular disease development and progression. This research builds on prior studies that show that the saturated fat and cholesterol found in red meat is not the cause of increased risk for heart disease, but rather digestive metabolism plays a significant role in disease etiology. The study did not determine if carnitine from supplements increased disease risk, but the implication is that the type of diet may play a role. Until further research is concluded, health-minded individuals may want to avoid carnitine supplements and continue to shun red meat consumption in favor of fresh vegetables, legumes, nuts, seeds and fruits.